We payed particular attention to achieve reliability, robustness and ease of use. Particularly important: Our Gas Regulators and our ELEGANCE Gas Stop Valve functions reliably even when you lose control of your model due to total failure of the RC-Gear. Our Automatic ELEGANCE Gas Stop Valve is a true ground breaking innovation, it provides clear improvements to the safety of your valuable model and the prevention of serious damage to it. You will find the Automatic ELEGANCE Gas Stop Valve exclusively only here with us! 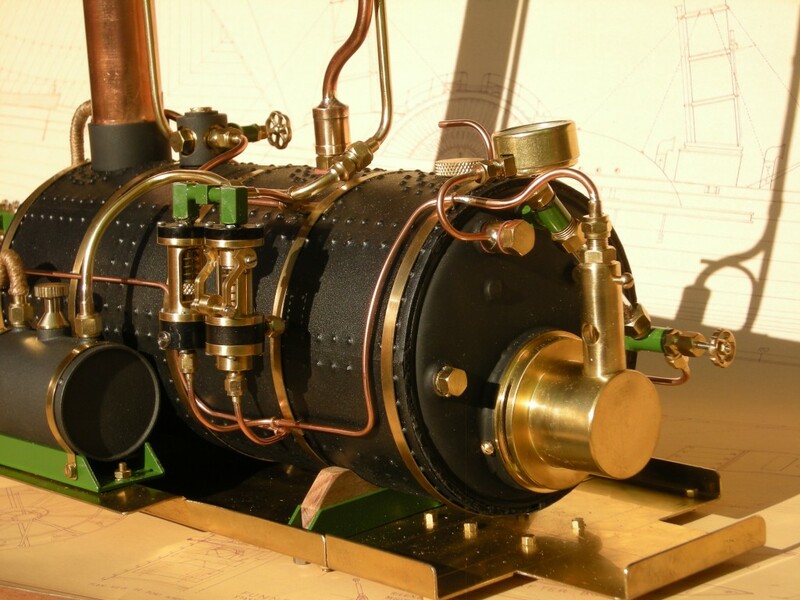 If the unthinkable happens and the boiler runs dry, be it because of a pump failure, a total break down of the RC – Equipment or even simply because the boiler has not been refilled with water then, after the last few drops of water have evaporated, the steam pressure will suddenly collapse. In this situation the Gas Regulators will, as it is their function, switch the gas flow to the burner to full force! With a dry boiler this can lead to dangerous overheating which in turn can cause serious damage to the boiler or, in extreme cases, even to a total loss of a valuable model! 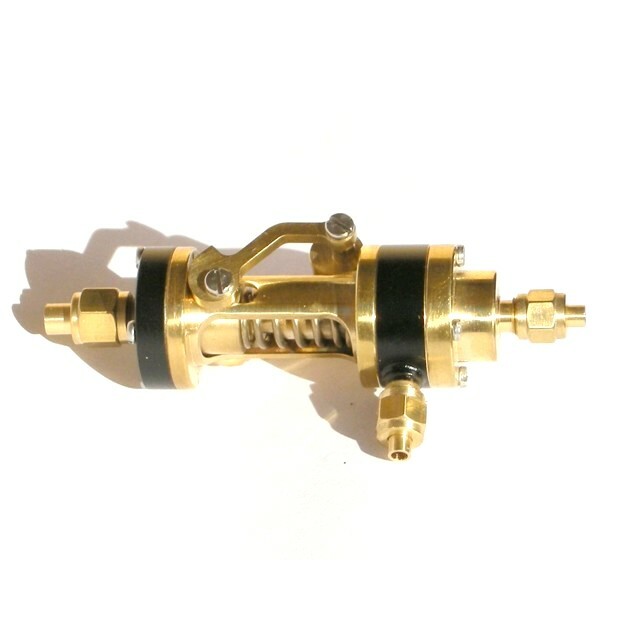 In such a case our Automatic ELEGANCE Gas Stop Valve will step in and interrupt the gas flow to the burner completely as soon as the steam pressure sinks under a certain predetermined level. 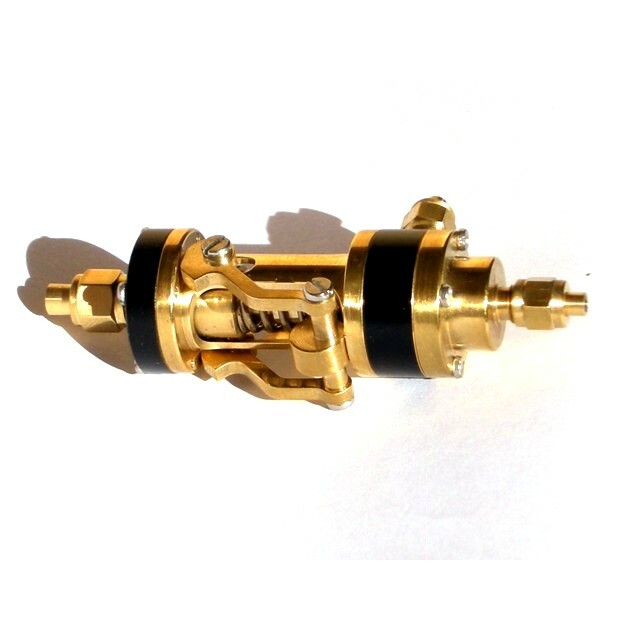 Even a complete failure of the RC – Equipment will not stop our ELEGANCE Gas Stop Valve from functioning because it works completely independent from RC – Equipment or batteries. The ELEGANCE Gas Stop Valve uses the principal of a counter weight. When starting to heat the boiler up the locking lever is brought to its “heating up” position. In this position the lever holds the valves gas passage open during the heating up phase regardless of the absence of steam pressure. 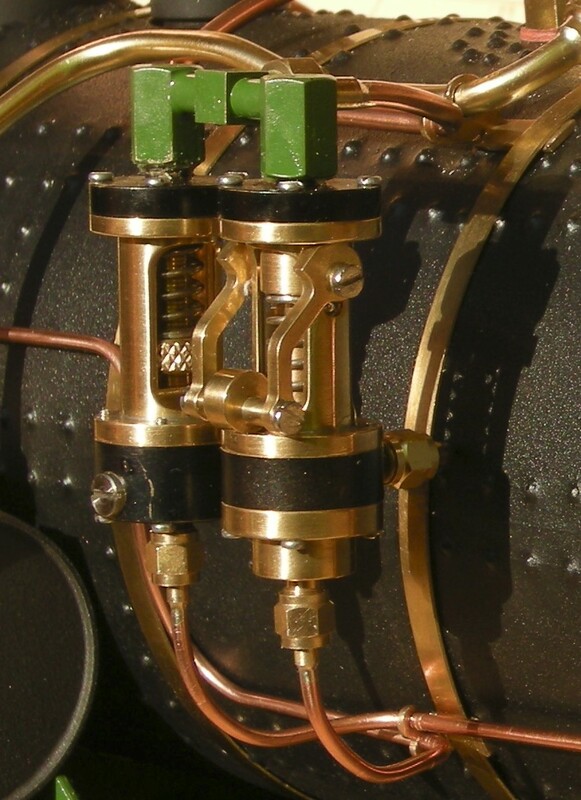 As soon as the steam pressure reaches a certain level the locking lever drops to its “working” position, now the valve is only kept open by the steam pressure. Should now the pressure drop very low the ELEGANCE Gas Stop Valve will cut off the gas supply to the burner completely and therefore safe boiler and model from serious harm! As long as the boiler is still under pressure. 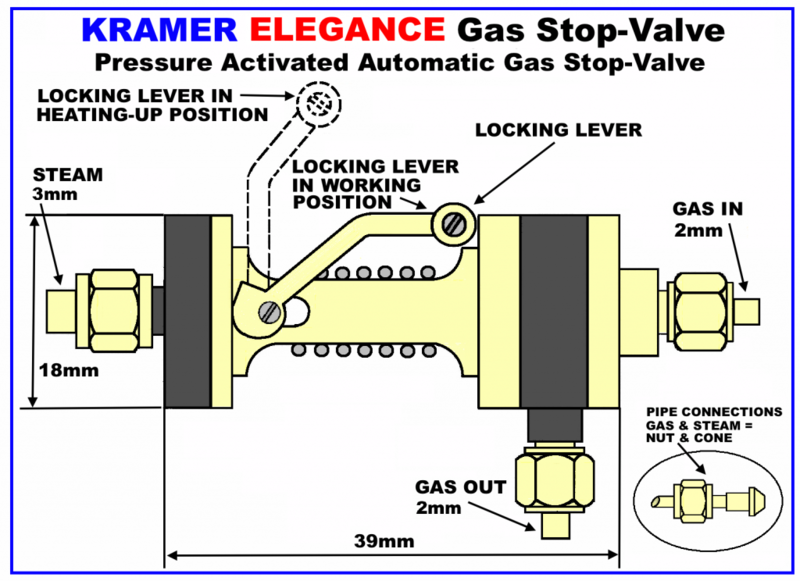 The ELEGANCE Gas Stop Valve will only become active after the steam pressure has sunk to near zero. For an example when the burner goes out. 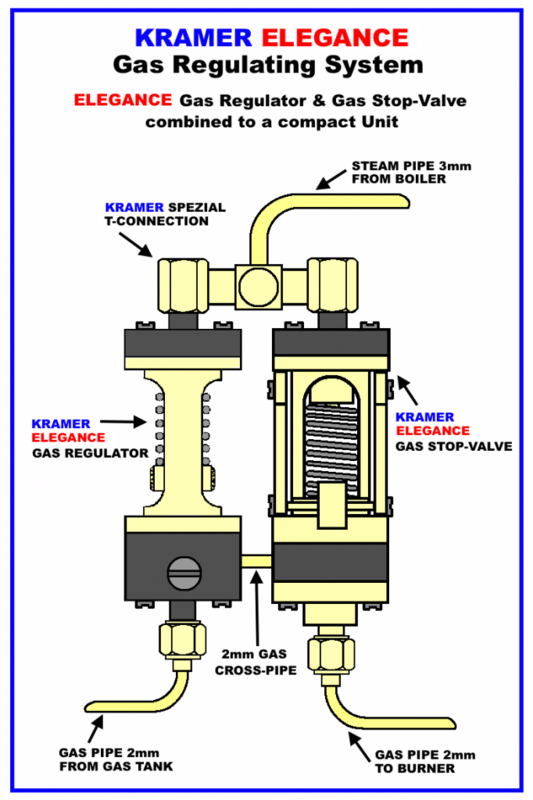 In such a case gas will keep flowing until the boiler has cooled down sufficiently for the pressure to sink low enough.But after that has happened the Gas Stop Valve will cut off the flow of gas. If a fire breaks out due to a leak in the gas pipes the Gas Stop Valve will not provide any protection because in such a situation the boiler pressure usually does not sink significantly. 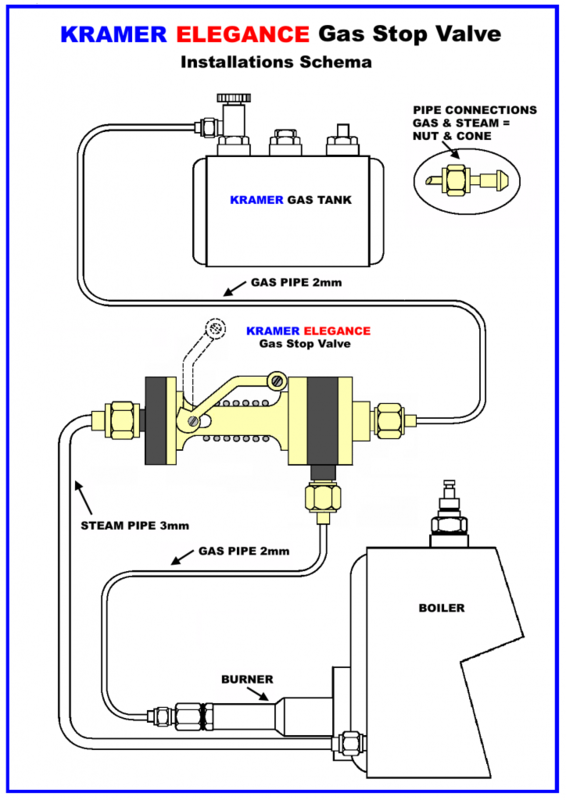 When the ELEGANCE Gas Stop Valve is installed on its own it will simply be fitted in between gas tank and burner as shown in the installation schema. When employed together with either ECO or ELEGANCE Gas Regulator the ELEGANCE Gas Stop Valve needs to fitted between gas tank and Gas Regulator. If a special T- piece is is used only one steam connection to the boiler is required and Regulator and Stop Valve can be combined to a neat and compact unit. 2 x Pieces of brass pipe 3mm diam. 4 x Pieces of brass pipe 2mm diam.